Children by nature love sharing. Observe a toddler who keeps offering you things and expects you to return them to him with a broad smile and a thank you. Often parents look at the approaching school holidays with trepidation. The one thought that pervades their minds is how to keep their children occupied so that there is peace in the house. Squabble for the same toys, squabble for the TV remote and bursts of anger and tears for not being given the promised game or toy – these are scenes witnessed in many homes. Sometimes, one of the siblings appears less demanding and adjusts to the whims and fancies of his brother. At times there is perfect harmony between siblings and the older child finds it natural to share his toys and other stuff with the younger one. Here we tend to praise the selfless kid who loves his sibling and cares for him. 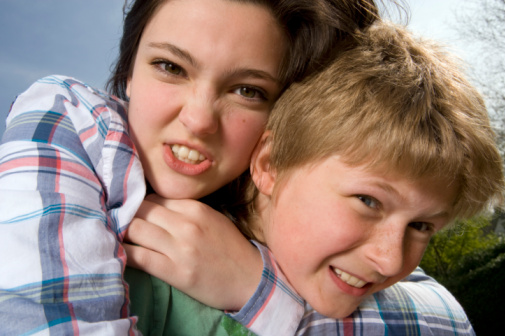 Kids who fight with their siblings or show bullying tendencies are not necessarily selfish kids. They are simply kids who are not emotionally secure. Imagine the home of Mr. Khanna who has two boys, six-year-old and eight-year-old. The boys have exactly the same number of remote control cars, the same video games and other toys. As the younger boy always likes his elder brother’s toys and insists on playing with them, Mr. Khanna has no choice but, to buy the same things for his kids. His elder son refuses to share his things with the younger one and throws a temper fit if the younger one asks for any of his games. Mr. Khanna assumes that this is simply a case of sibling rivalry and that his older son will one day show signs of maturity and start sharing with his younger brother. Till then, Mr. Khanna is happy buying duplicates of every toy and game for his two kids. Mr. Khanna feels he is buying time and the day will come when his boys will bond together again. This, sadly, may never happen. The boys might grow up with feelings of jealousy for each other growing deeper. At times, when the siblings are constantly fighting over things, the parents lay down ground rules for sharing. They set time limits for each child for the video games and enforce their limits on their kids. Like Mr. Khanna, such parents also do not succeed in their efforts. They may be able to buy immediate peace in the house. However, the moment the aggressive child gets his turn at the game, he will tease his sibling and revel in his victory of getting the game from his parents. Again, the scene of tears and drama will be recreated, nullifying the efforts of the parents who had set the rules for sharing. Children by nature love sharing. Observe a toddler who keeps offering you things and expects you to return them to him with a broad smile and a thank you. Even as they grow older, kids love to have their friends over and share their toys and games. But few kids appear selfish as they refuse to share or they are too demanding. Such kids always want their parents to buy new toys and games. They would throw temper tantrums or bully their siblings till their demands are met. They want instant gratification of their demands. With both parents working they prefer to give in to the demands of their belligerent child. It is important to look deeper into the psychology of the difficult child. This child is screaming for his parents’ attention through his demands. This child has an emotional need, which he is trying to fulfill through other means. Any child who is not secure, who cannot connect to his parents and family appears selfish to all. As parents it is our responsibility to connect to our kids. All children have needs, and as parents we are responsible in fulfilling their needs. In our present-day world, we are all working hard to provide for our children. We look into their basic needs, give them the best of clothing, food and other comforts that we can. What we often fail to give them is our time. Our children need us more than they need the material things around them. It is understandable that with both the parents working and juggling household chores, time is valuable. As a baby the child would hug his mom or cry on his dad’s lap whenever he feels hurt. As a young boy, the child has to go to school and for other activities, so the distance grows between the children and the grown-ups as it becomes difficult to find free time together. Children who are emotionally secure and feel connected to their parents appear confident and can adjust to the changing environment, for example, starting of school, the birth of a sibling or changing of house or city. However, children who cannot relate to their family members appear aggressive and selfish. When it comes to improving and maintaining our relationships with others, Stephen Covey’s metaphor of the emotional bank account is probably one of the most powerful ideas ever created for the development of interpersonal relationships. To make our children emotionally secure, to teach them sharing and other values, we need to build on their emotional bank accounts. Then, we will observe that we have affectionate and thoughtful children who do not hesitate to share their belongings with their peer group and are winners in life. You are very good, both as a writer and a mother who knows child behaviour. This is excellent and what I conclude looking not only into child behaviour but every one else too-- is our total attachment to material thing and trying to get happiness from them. I have observed that those children who do not have many toys but are involved in Pooja, Yoga or Soccer or Kabbadi or just jogging ,are more sharing and caring and well groomed and better educated. That method of raising a child needs a lot more work from parents--a parent has to go to soccer games, do pooja with the child etc.-- than simply giving them toys. It only teaches the boys to get his and for the rest he learns at a tender age --who cares ! We are training our kids towards the culture of -- WHO CARES ! That is why rich and super rich are the ones shooting and killing their own , or suing them --they each want to get the TOY ! There is hardly any family left not in a law suit with the siblings ove property --a perishable TOY ! You can change this for the future by exhorting youg parents lo pray with thier kids, go to jog with them or go to soccer games rather than getting rid of the child by bringing TOYS. Enough TOYS!! Very well analysed Radha. Good parenting is a very fullfilling job and requires deep understanding of child behaviour - each child is so different and needs to be handled individually. I am writing this on Mother's Day, and what better reward for a mother than to see her little ones acting flower into responsible adults. A good study Radha. Yes we need to give more time to our children. I also agree that a close connect,a close emotional bonding between the siblings& the parents is also very necessary, more so in the digital world of today. Well done Radha and Kudos to the publisher, Rajendra bhayi for the befitting image. A very well written piece-keep it up.